With lyrics about back roads, dirt roads and one stop light towns, country music is no stranger to showcasing what small town life is all about. Often, country stars flock to these small communities to film videos for their biggest songs. From the open fields of Texas to the main streets of Tennessee and Oklahoma artists like Midland, Luke Bryan, Blake Shelton and more are filming music videos in the towns that show the essence of true southern roots. Take a look at these 10 small southern towns serving as the backdrop to some of your favorite country music videos. Midland burst onto the scene with their debut single, "Drinkin' Problem," and that track's video also highlights the town of Lockhart, Texas. The clip shows the band driving along the open fields, selling moonshine out of the trunk of their car. The music video for "Small Town U.S.A." is an ode to Justin Moore's hometown of Poyen, Ark., which also inspired the tune. In the clip, Moore plays guitar in front of local landmarks across Poyen. Filmed in Smithville, Texas, the video for "Vice" shows Lambert as she emerges from a car wreck and walks the streets of her hometown. She stops for drinks and cigarettes before heading out of town in a black sedan. Brad Paisley put out a casting call for locals in the small Tennessee town of Franklin when shooting his music video for "Heaven South." 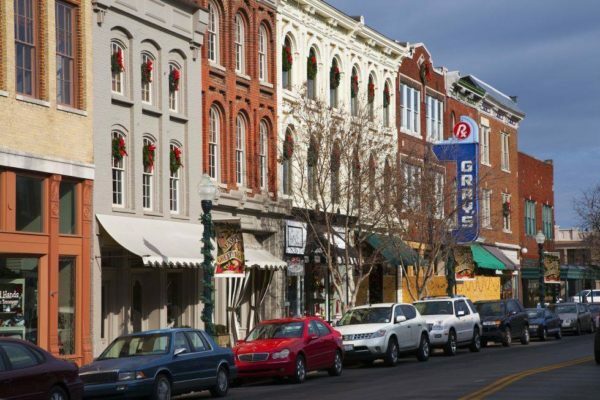 Franklin, Tenn. is a charming town just a few miles south of Nashville. In the clip, Paisley drives down country roads and into the town square where fans are waiting to sing along. This is us. Heaven South. Jason Aldean returns to his roots for "Gonna Know We Were Here." The dad-to-be filmed the video at Windsor Academy in Macon. You can see Aldean walking down memory lane as he walks through his old high school stomping grounds. Kingsbury, Texas was the setting for Dierks Bentley's "What Was I Thinkin'" music video. It's about 40 miles northeast of San Antonio and is only home to around 780 people. Bentley drives through the town's empty roads as he thinks about his wild night with a girl named Becky. Montgomery Gentry introduces the small town of Perryville in the video for their Top 5 single, "My Town." In the clip, you'll see the town's water tower as well as the welcome sign. Perryville is 10 miles from Eddie Montgomery's hometown of Danville and about 40 from the city of Lexington where Troy Gentry grew up. Watertown is the filming location for Ashley McBryde's "Little Dive Bar In Dahlonega." The video follows a few people who randomly wind up in the small town and try to make the best of it all. Blake Shelton brings fans on a personal tour of his hometown in the music video for "Bringing Back The Sunshine." The country star drives down the streets of Ada in his old Chevy and waves at the welcome sign as he passes by. Hurricane Plantation in Claxton is the setting for part of Luke Bryan's "Rain Is A Good Thing" video. Local farmers talk about the importance of rain for their crops alongside footage of Bryan's 2009 Farm Tour.